Bethany United (originally Methodist) Church was designed by several unrecorded English architects and built by the residents of Petites circa 1859. It is said to be one of the oldest surviving wooden churches in Newfoundland. Bethany United Church is a good example of an early, wooden, Gothic Revival church. Year-round settlement began in the 1840s, when families from Grand Bank and Fortune settled at Petites, encouraged by merchants interested in the southwest coast fisheries. The name may be derived from the Petite family, who lived on the north side of Fortune Bay. The exterior of the church retains much of its original character, though the tower was replaced in the 1940s after being struck by lightning. 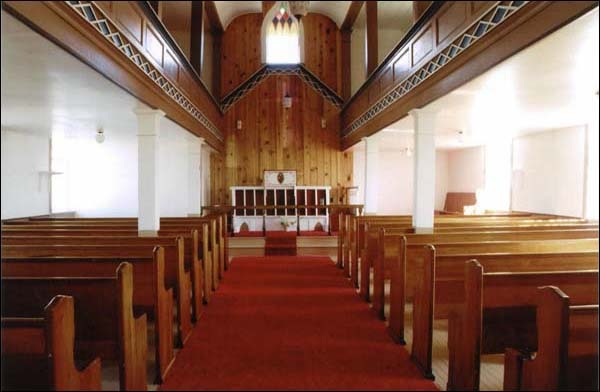 Although the interior has been renovated and modernized, the original pews, balcony, windows, altar, columns and diamond-pattern moulding remain. Interior details like the balcony, classical columns and decorative diamond pattern moulding is a testament to the community's craftsmanship. © 2005. Image reproduced by permission of John C. Ralph. The community of Petites was resettled in October 2003, and the remaining homes are now used for summer residences. The fate of Bethany United Church is uncertain, though measures are being taken to move the church to nearby Rose Blanche, following the path of its congregation. The last service held in Bethany United Church was on September 21, 2003. 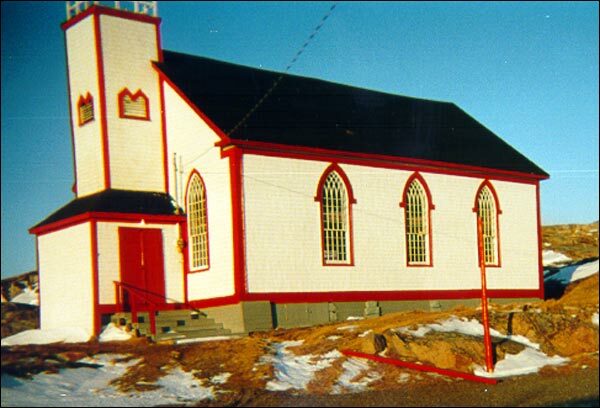 The Heritage Foundation of Newfoundland and Labrador declared Bethany United Church a Registered Heritage Structure on June 4, 1994. Also view Bethany United Church Registered Heritage Structure on the Heritage Foundation of Newfoundland and Labrador web site. The Newfoundland and Labrador Heritage Web Site has on its site only a portion of the registered heritage structures in Newfoundland and Labrador. To view a complete list or search for a particular structure visit the Heritage Foundation's Property Search page.